You go for a holiday to the beach, you happily say yes. When you get to the beach it's all stormy, someone's stolen all the sand and there's about to be a tsunami. Do you want to stay there just because you said yes earlier or do you want to make another decision now you've seen the reality? This is where we are at with the EU vote. All we've had is endless project fear. To use your holiday comparison, we haven't even got there yet so how do we know what the beach or weather are going to be like? I don't think as badly of Theresa May's deal as might have been expected. It honours the referendum result whilst keeping the Irish border open. The fact that the Irish government do not mind the deal has offered some reassurance. A People's Vote would be a perfect way of delivering an up-to-date mandate for/against an up-to-date Brexit by an up-to-date electorate. It is ridiculous as well as unfair that people born between June 1998 and April 2000 were considered old enough to vote for/against Councillors in 2018 but not for/against Brexit occurring in 2019. Especially as they are the people who in most cases will have to live with the consequences the longest. I bet it will get like 2 minutes of discussion in parliament max before they go to the next question. Like most online petitions it really isn't worth the paper it is (or isn't?) printed on! But how many are genuine signatures? how long does it take to make a random email address? I've been reassessing what I knew about lemmings as a result of the referendum and all the associated goings-on and unmitigated claptrap, admittedly not all from one side. I now feel I understand the lemming psychopathy a little better. So lemmings are reputed to be kamikaze, with a penchant for diving off cliffs to their certain death, and doing this as a group activity. I now think that perhaps things are a little more nuanced than that. I reckon lemming communities actually hold a vote everytime some are considering a mass dive,and it may go like this:- approx one third don't vote, another third vote for a dive, and the remaining third... well, wish to remain alive. Now let's pluck a figure from the air: 52% of those lemmings who voted wanted to jump off the cliff, leaving 48% not wanting to. The problem is with lemmings, it's all or nothing, so the 48% are forced to go through with it too. Reading about lemmings, they are the most 'angry' of rodents, and it was thought in olden days that they could 'literally explode with anger' according to the Encyclopaedia Britannica! They also have a propensity to physically attack other lemmings in their frustration. Goodness, aren't they backward?THEY could learn so much from us LOL. It's the whole democratic process in this country that is being undermined here with parliament effectively saying "well we(reluctantly) gave you your referendum but you got it all wrong..........clearly you didn't know what you were voting for...........it's not as simple as you seem to think.........we know best............ leave it with us and we'll sort out the mess you've made.............."
I don't really see how a general election is going to resolve much either, firstly how many people would even bother voting? And in the last election Labour pledged to honour the referendum result and did better than expected whilst the Lib Dems who pledged to hold a second referendum came absolutely nowhere. And all the time this nonsense drags on other issues such as knife crime are not getting the attention they deserve. I agree with your first paragraph and the point about a general election however mentioning knife crime is, TBF, not relevant at all when it comes down to not getting attention. The knife crime issue isn't a new problem like the media likes to report and all the different aspects as to why it happens have been known about for many years with successive governments simply turning a blind eye or tackling just one out of the many aspects which in reality does extremely little. Dang I didn't know about the forest hill until you just linked it, literally went to school in the area and still live few minutes away. Crime lately is off the charts. I understand that Tower Transit are unique among London bus operators for having all their routes entirely within boroughs that voted Remain. 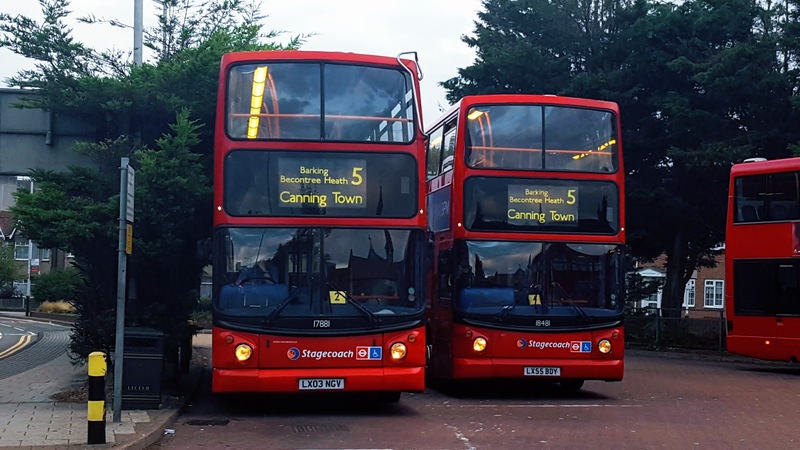 Uno's only TfL route 383 is entirely within Remain boroughs, but they have buses in Leave boroughs outside Greater London. Indeed, her deal will soon have gone out to a Parliament vote even more times than route 188 has gone out to tender. The default setting is now for a no deal exit on April 12th, bring it on I say!